LANTIRN is a system consisting of two pods which allow aircrew to fly their aircraft by day or night and in adverse meteorological conditions. It provides Terrain-Following Radar (TFR), Forward-Looking Infra-Red (FLIR), targeting information for the aircraft's on-board fire control system and target laser illumination. LANTIRN is currently deployed on F-16C/D, F-15E/I/S and F-14 platforms. Over 1,400 pods are currently in service with 10 countries. The research and development program, initially conceived as a capabilities upgrade program for the F-16, began in September 1980 with Martin Marietta (now Lockheed Martin) as contractor. Two years later, in 1983, the program was already suspended and reshaped to reduce the technical risks involved with the development of the advanced technology, most notably the Automatic Target Recognizer (ATR) sub-system. The ATR was meant to automatically discriminate between various battlefield targets such as MBT's, SAM's and APC's. Eventually it was decided not to incorporate this functionality from the start of the program on, but instead to add it under a later retrofit program. Ultimately, the ATR never made it into LANTIRN. Flight trials with the LANTIRN wide-angle HUD began in the summer of 1982. By that time congressional support for the program had all but vanished and the House Armed Services Committee warned that it had seriously considered recommending denial of all 1983 authorization of funding'. Flight testing, using dummy pods (equal to the real pods as far as weight, shape and mass distribution are concerned) started in September 1982. The pods were instrumented so that accurate measurement of vibration and flutter could be performed. One year after tests with the HUD started, in the summer of 1983, flight tests with fully functional pods started with two F-16B and two A-10A aircraft. By the winter of 1984, LANTIRN had completed operational tests in adverse weather conditions during combined Development, Test and Evaluation (DT&E) and Initial Operational Test & Evaluation (IOT&E) deployments in Europe. Congressional support declined further when Congress stipulated that, before a production decision could be taken (expected in 1985), LANTIRN had to be tested in competition with the FLIR-pod Ford Aerospace had developed for the F/A-18. The USAF was prohibited to order LANTIRN into production before the testing was done with. By that time, LANTIRN had become a key component of other programs such as the F-15E dual-role fighter program, and as such was no longer regarded as a sub-system of the F-16 but as a program in its own. This in turn led to huge cost overruns, since development costs of LANTIRN could no longer be billed on the F-16 program. In real terms, cost overruns amounted only to some 10%. Ultimately, LANTIRN was chosen for the F-16C/D and F-15E and has recently been fitted to US Navy F-14 aircraft as well. The Air Force could finally approve low-rate initial production of the navigation pod in March 1985 and full-rate production in November 1986. The first production pod was delivered to the Air Force March 31, 1987. The initial contract was for 561 navigation and 506 targeting pods and it had a $2.9 value. The complete LANTIRN system adds about $4 million to the cost of the aircraft which is a real bargain for turning day into night. In April 1986, IOT&E of the LANTIRN targeting pod proved that a low-altitude, night, under-the-weather, precision attack mission was feasible. The Air Force approved low-rate initial production in June 1986. Introduction of the LANTIRN revolutionized night warfare by denying enemy forces the sanctuary of darkness. The LANTIRN system comprises two pods; one AN/AAQ Navigation Pod ("To Fly"), and one AN/AAQ-14 Targeting Pod ("To Fight"). The pods were conceived in a way that allows them to operate autonomously, so either pod can be used without the other should the need arise. The pods communicate with aircraft systems through a standard 1553B data-bus. The main sub-systems of the navigation pod are a Texas Instruments Ku-band terrain-following radar (AN/APN-237A), a wide field-of-view (WFOV) forward-looking infra-red sensor, and the necessary computers and power supplies. The TFR uses advanced signal processing to provide a wide azimuth coverage, which in turn allows more violent maneuvering of the carrier aircraft. This is because the system can provide directional inputs to the pilot or the flight control computer, whereas older systems only provided pitch-up commands. The TFR significantly enhances the aircraft's chances to survive on the modern battlefield, since it not only allows the pilot to automatically avoid the terrain but also enables to evade air defense systems by maneuvering in the horizontal plane. The radar can be linked directly to the F-16's autopilot to automatically maintain a preset altitude down to 100 feet while flying over virtually any kind of terrain. I has five modes five modes: Normal, Weather, ECCM, Low Probability of Intercept (LPI), and Very Low Clearance (VLC). The FLIR has a 28 degrees field-of-view in azimuth and 21 degrees in elevation. The resulting images are superimposed on the outside scenery by projecting them on the HUD. The image is grainy, but the sense of depth is good enough to fly by in total darkness or the smoke of a battlefield. Rain, fog, or smoke however, degrade the performance of the system, since infra-red energy is greatly absorbed by aerosols or water vapor. For an expanded perspective beyond normal HUD viewing limits, the pilot can HOTAS-select snaplooks left or right 11 degrees from the center. Another switch allows the pilot to select either a negative "white hot" or a positive "black hot" image, both green and white rather than black and white. Each pilot has his preference. Main sub-systems of the targeting pod are another FLIR and a laser designator/rangefinder. Both are housed in the movable nose section of the AN/AAQ-14, and are stabilized by a stabilization system which compensates for aircraft movement and vibration. The FLIR that is installed in a two-axis turret operates in two modes: a wide field-of-view (6x6 degrees) for target acquisition or a narrow one (1.7x1.7 degrees) for zooming in. When LANTIRN is not in operation, the turret is turned inwards so that the sensors are not exposed to the elements. The FLIR can be aimed independently for zooming in on the selected target. Data from the FLIR is fed into one of the multi-function head-down displays in the cockpit and is used to identify terrain features and/or targets at long range. The pod also houses Environmental Control Systems and a boresight correlator ("look where I look") hands-off system which passes targeting data to the aircraft's Fire Control Computer (FCC) and the weapon systems. The laser designator can "illuminate" targets for laser-guided bombs. It can also be used to automatically track moving targets on the ground as well as to designate them for AGM-65 Maverick missiles. It is even possible to designate targets for multiple Maverick shots in a single pass. Another use for the laser is to determine the exact distance of a landmark in order to update the aircraft's inertial navigation system. This can be critical to deliver both guided and unguided ordnance without visual references. The GEC-Marconi holographic Head-Up Display (HUD) was the answer to the USAF's request for a HUD capable of displaying the WVOW FLIR-imagery of the LANTIRN Pod. The design of the new HUD was particularly challenging; conventional optics do not allow implementation of such a large combiner glass. New holographic technologies (diffraction gratings; simply put, they reflect light of a particular wavelength or color with high efficiency while transmitting all other wavelengths with little absorption) were applied, in the mean time ensuring that the HUD installation would not interfere with the ejection line (i.e. allow enough space for the legs and feet of the pilot during ejection). Designers want to place the HUD as close to the ejection line as possible to maximize the FOV. In the case of the F-16, the combiner glass of the HUD also serves as windshield during ejection, since the one-piece canopy is jettisoned completely thus exposing the pilot to the slipstream. The HUD combiner glass needs to be strong enough to withstand these forces. As a tribute to the GEC-Marconi engineers who designed the HUD, completely functional examples have been retrieved from crashed F-16s. A more compact, more powerful computer system. The 8- to 12- micron FLIR uses quantum well technology for low-cost construction of extremely dense detector arrays. It extends weapon standoff range more than 50 percent, adding the mission flexibility of battle damage assessment and reconnaissance. Greater standoff range ensures less aircraft attrition. This third-generation FLIR is 23 percent more reliable. The diode pumped laser operates at a greater range with a smaller spot size. Its lower beam divergence, greater resolution and pointing accuracy at 40,000 feet expand the altitude and range of the targeting pod. The diode-pumped laser is 17 percent more reliable, thanks to an improved power supply, fewer parts and a cooler operating temperature. An eye-safe training laser with tactical performance and range is integrated. The LANTIRN 2000 computer is smaller, weighs half as much, and uses two times less power than the computer it replaces. Throughput, memory and reliability are optimized. Software, cabling and interfaces remain the same. A laser spot tracker to improve target identification and limit collateral damage. A TV sensor, which has been successfully tested and flown, provides added capability around the clock. For international customers, Pathfinder and Sharpshooter are (cheaper and slightly less capable) derivatives of the LANTIRN navigation and targeting systems respectively. The first operational F-16s to be equipped with LANTIRN were Block 40/42 models, sometimes referred to as the "Night Falcon". Due to the USAF's concept of "misionized aircraft", which was extended to individual blocks, Block 40/42 F-16CG/DGs remained the only LANTIRN-capable F-16s in the USAF inventory for a long time (except for some F-16Bs which were used in LANTIRN-tests at Edwards). Concurrent with the LANTIRN effort, the US AFRES earlier production fleet of some 125 F-16A/Bs have been upgraded with British Aerospace Systems & Equipments (BASE) Terprom system software. This system has been added to avoid Controlled Flight Into Terrain (CFIT) - an euphemism for crashing during low-level flights - which is a serious hazard in the absence of a good FLIR like LANTIRN. The Terprom source code is incorporated in the 32Mb Fairchild DTM cartridges, capable of storing 400nm2 of digital terrain data. In February 1998, USAF announced plans to upgrade Block 25 and Block 30/32 aircraft and equip them with navigation and targeting pods, possible candidates being the LANTIRN, LANTIRN 2000 and (Israeli) Litening systems. A decision has yet to be taken. Foreign customers such as Greece have ordered Block 50 machines with LANTIRN-capability, and the Netherlands will fit LANTIRN to their MLU F-16s. 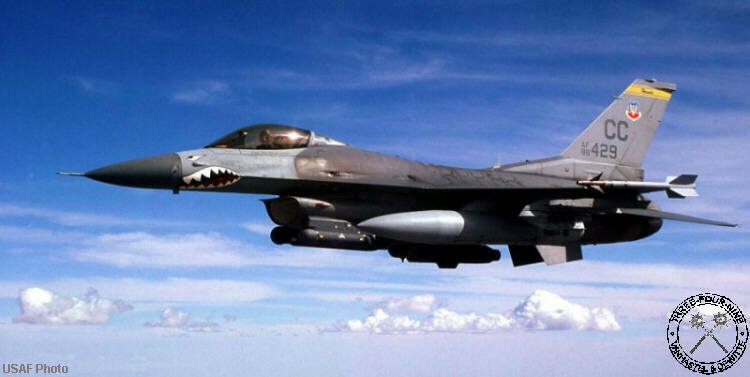 The configuration of LANTIRN night vision pods planned for the Dutch F-16 Midlife Update (MLU) program took flight for the first time in September 1997 aboard an advanced version of the U.S. Air Force F-16D. 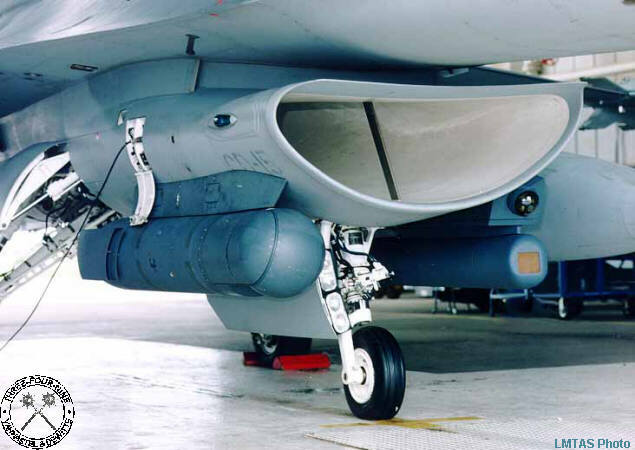 A Block 50 F-16, with a cockpit display virtually identical to that of the Dutch MLU aircraft, carried a LANTIRN targeting pod with electro-optical and television sensors and a LANTIRN Pathfinder navigation pod with a Laser Spot Locator. Flights included day and night imaging operations. The F-16 carries the LANTIRN pods on its chin stations: the AN/AAQ-13 Navigation Pod on the port station (5L) and the AN/AAQ-13 Targeting Pod on the starboard station (5R). The weight of the pods necessitated strengthening of the internal structure of the F-16 and of the undercarriage. 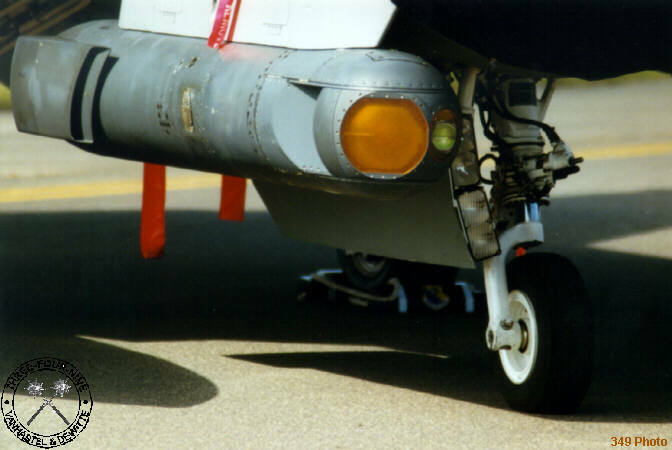 The reinforced landing gear resulted in bulges on the landing gear door, to accommodate the larger tires, and a relocation of the landing gear lights to the edge of the landing gear doors. Data from the Navigation pod is presented on the HUD; FLIR imagery is displayed so that it exactly overlaps with the real world outside, thus providing a clear view of the scenery at night or in adverse weather (not when raining; the FLIR can't see through rain because water has an absorption peak at IR wavelengths). Steering cues from the TFR are either fed directly into the flight computers or presented on the HUD so the pilot can take appropriate action, both solutions allowing the pilot to follow the contours of the terrain at a preselected height. The NFOV FLIR-imagery from the targeting pod is presented on one of the heads-down displays. After acquiring a target (for example via the radar or visually through the WFOV imagery on the HUD, the pilot can bring the targeting pod's FLIR to bear and identify the target. In the case of the AGM-65 IR Maverick, the missile's seeker head can simply be cued on target by the aircraft's Fire Control computers and thus to LANTIRN (which feeds it data into the FCC). Target acquisition by the missile would be almost immediate after the AN/AAQ-14's FLIR has acquired it. The pilot need only check that the Maverick has locked on, fire it, and slew the FLIR to the next target after which he can directly fire another missile. If the pilot wishes to use other weapons, the built-in laser designator can illuminate the target for laser-guided ordnance, or can obtain accurate range information for accurate delivery of "dumb" ordnance such as cluster bombs or iron bombs. The maximum height at which the laser can be used is 12,000ft (due to attenuation in the air).